In the East, the Ruby-throated Hummingbird is wide ranging, from southern Canada to Florida. Most hummers winter in Mexico and Central America although it has been thought that a few winter in the the very southeast. These could be Black-chinned hummingbirds however, as the females and immatures of these two species are virtually indistinquishable. Hummingbirds have been known to travel over 2500 miles on their biannual migrations. Because of this, they are symbols of accomplishing that which seems impossible. Their playful aerial displays and squeaky cheeps remind us to seek joy as we drink from the abundant nectars of life. 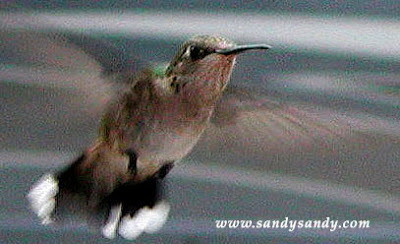 See more photos and my original hummingbird art on my web site, www.sandysandy.com and www.spiritart.us. See My New Squidoo Lens ~ Happy Hummers! Shacks and Fishing Boats Have Spirit!